1. Pinterest is your friend! This may be cliché, but most of us use pinterest for all sorts of things, including crafting ideas, style inspiration, cooking and even filofax! If you've been living under a rock of some sort until now, I urge you to sign up and create a board titled "decoration", "redecoration" or something of the sort, and start pinning! This is the very first, essential and useful step you should take, and don't be afraid to go crazy: pin everything and anything you like. 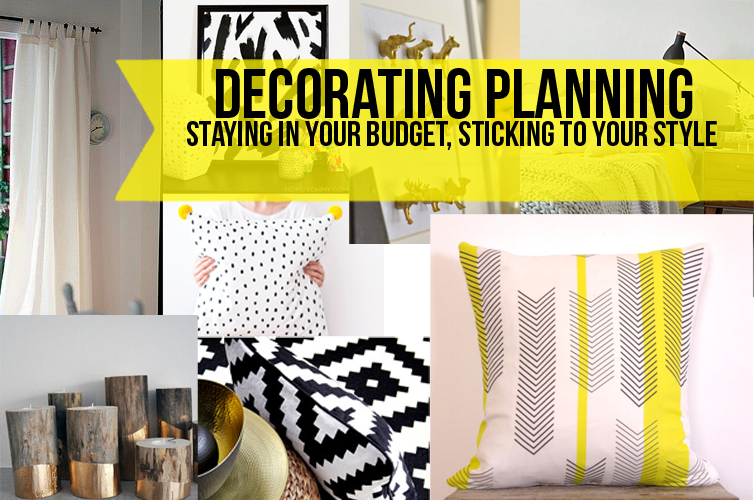 Check out my pinterest board for decoration inspiration! Tip #1: search your local stores (or ones that ship in your area) for items you might like, and pin the pictures of the items directly from the store, so when you click on it later, it will redirect you and you'll know where to purchase it from! 2. Create a theme and a color scheme! I cannot stress how important this step is! For most of us leading busy lives, starting a redecoration process, especially after the general excitement of the prospect of a new interior wears off, can be unnerving, since we want it all, and we want it fast! This can amount to going crazy with pre-ordered items of all shapes, patterns, colors and sizes that we all separately love, but don't match! Sticking to your theme can save you time and money: once you have it figured out, it's easy to weed out the items in your shopping cart that are cute, but maybe in a whole other setting. Always ask yourself these 3 questions: Do I need it? Do I have a place to put it? Does it match my theme and scheme? Now, let's clarify: the color scheme should be obvious, but it shouldn't involve more than 5 colors, and maybe certain shades of those 5 base colors. The scheme involves a number of things, including style (shabby chic, minimalist, classic etc. ), patterns, fabrics. An easy way to start this process is to start off with the color scheme. Your color scheme should be made up of 3 or 4 parts: the base colors, the accent colors, the metallics, the fourth part is made up of the wooden textures of the room, but this sometimes corresponds to the base color category if for example your walls and wooden furniture are the same colors. My base colors are all neutral: black and white, and grey, since it is a shade of both. My two accent colors are yellow and rose gold. The wooden texture I picked is the shade that my furniture is, but I want to be sure to have it on hand if I pick up additional pieces of furniture, since I want the same wood, in the same shade and texture. Now, let's talk about the scheme. My style is minimalist, with a few decorative details (notice the candle holder, golden animals, pom-poms on the pillow). I want to have different patterns in my room (on the rug, pillow cases, in picture frames etc.) but I want to be sure that even if they are different, they are all loosely related, so to speak. 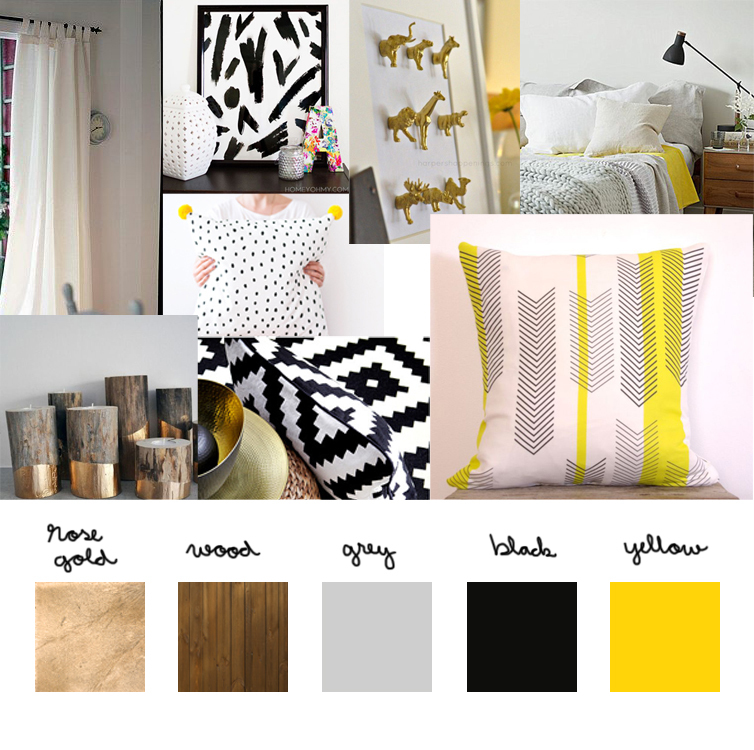 As you can see, I use geometric patterns (that correspond with my minimalist style) in the colors that are in my color scheme. I also use my accent colors sparingly: a few splashes here and there, to liven up the neutrals without being too much. Tip #2: Be careful with the metallics! Not every silver and gold are the same: choose one and go with it, to make everything pretty and matching! While browsing for items, it's easy to get sucked in and ending up binging in home decoration items that will clutter up your space. Sticking to your theme and scheme, create a plan. Or, better yet, sign up for my newsletter so I can send you an in depth but easy to use decoration planner insert, along with an editable digital planner made for planning out your purchases! The insert will contain spaces for your color scheme, a list to write in items, prices, where you purchased them from all in a cute, pretty design made by Black Forest Designs, for my most exclusive readers only!